Five days after Remembrance Day, on November 16th, 2011, I gave a talk about the effects of War on my family, as I had come to understand them. It is known as a Pecha Kucha Night and the format allows each presenter to show 20 slides with exactly 20 seconds to speak about each one. When I agreed to do this, I had no idea of the difficulties I would face just trying to put my story into this format nevermind what else would come from this process. 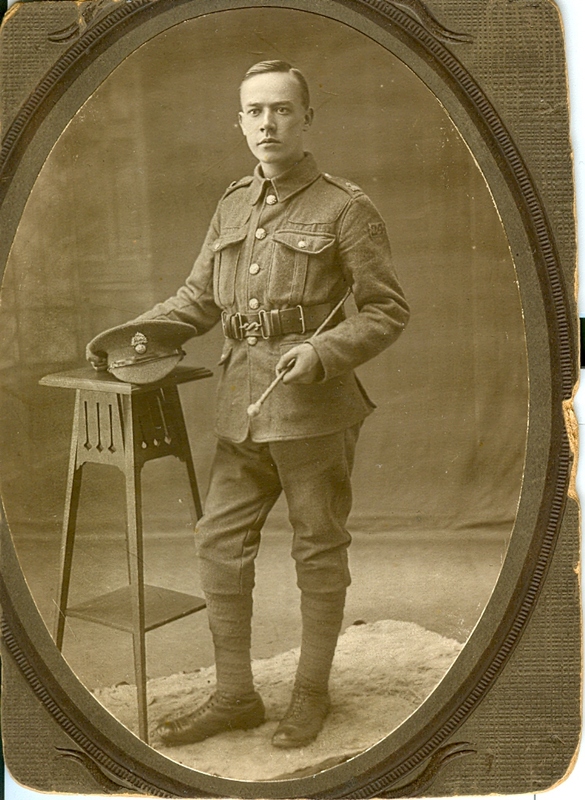 With my father’s help, I was able to uncover that my grandfather was part of the “11th Royal Fusiliers “A” Company”. He was wounded and sent home in September of 1918. Further research allowed me to begin to picture and feel life in the trenches. One story even mentioned the thousands of frogs that bred in the water-filled shell-holes. It was certainly not a pleasant jaunt through France from December 1916 through to September 1918. I read countless stories left in Regimental diaries of little known, long forgotten skirmishes that lead up to the historical battles that my generation might remember. They were fought by brave men, many who did not survive the day. But the fallen have a place and their story in history, marked by a stone where they fell, leaving loved ones and the chance to create new generations. 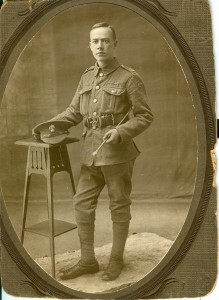 My Grandfather died as a result of his wounds almost 20 years to the day he was discharged. His stone marker bears no record of his service or why or how he eventually fell. 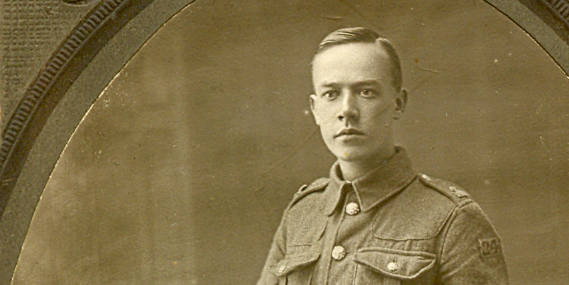 The real marker of his war experience was left on his son… and passed to his son and his son. A marker obscured by the fog of war and the passage of time. Since that incident of “The Soldier in the Hole”,as I came to call it, I have had more than a number of revelations – None more mysterious than how I had accessed this scene in the first place? My investigations lead me to stories of genetic memory and the workings of the unconscious mind. Speaking of which, I had played with the sizing of the picture I drew of the faceless soldier for a slide as I intended to super-impose the picture of the toad on it. Weeks later as I viewed the video of the presentation at the 5:30 mark there is a shot the video editor put up where I was shocked to notice I had unconsciously drawn the toad and never noticed. The picture of the toad I had found on the internet and overlain the cavity was posed in similar fashion, as if I had unconsciously picked that particular image in order to notice the one I had drawn. What a strange world. Since that Christmas afternoon where my father apologized to me, our relationship has never been better. I think the three generations (4 kids and 8 grandchildren) were touched and informed by the presentation. Both my kids attended the talk and have known of my struggles to reconcile the past. My life with them became so much easier as I understood where my anger came from and they benefitted immensely. My daughter is the first Hadfield to have graduated University (certainly won’t be the last). My son is an independent film maker. Just last month, my mother and father came over to visit my daughter and their first Great Grand-daughter, born Friday June 1st 2012. Her birth has marked the start of our fifth generation. It was a strange feeling to have all of the generations in one room and know that so much healing has happened in our family. That the effect and grip of my Grandfather’s war will diminish to the point that it becomes just part of our family lore that can be passed along to this new generation. I can only say thank you for taking the journey and discovering the cause and effect on all of us. You have not only healed your own relationships, you have revealed an incredible story and history to the rest of us. Thank you big bro!